Rtn. Dr. S V Ramprasad was installed as President and Rtn Murthy Vadapalli as Secretary for the Rotary year 2018-19. He announced his Board. 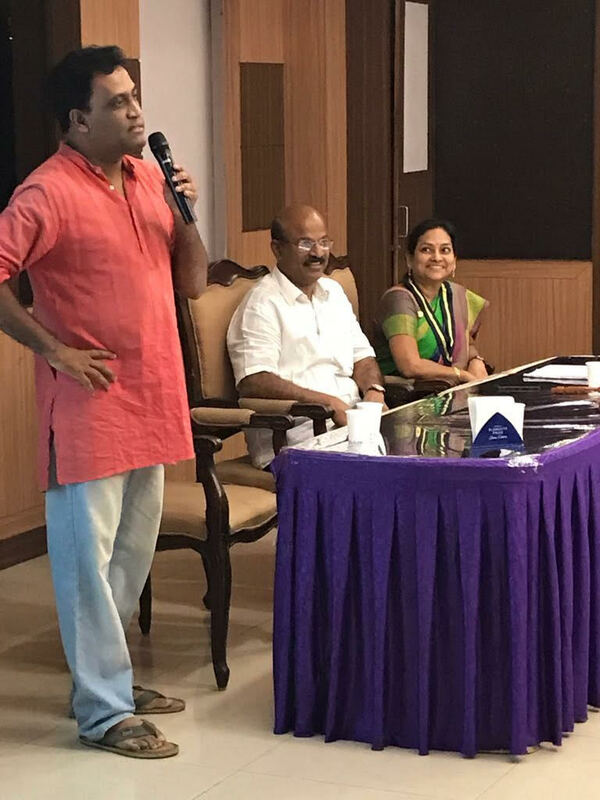 This was a very special meeting to celebrate Bathukamma, a traditional festival of Telangana state.Members of Rotary Club of Jubilee Hills spoke about 'why Rotary' and 'what interested them in Rotary'. Members were joined by families and guests for a wonderful fellowship with colourful 'Bathukamma' Celebration. PDG Sam gave a cash donation to for 'Daan Utsav', a week long 'Joy of Giving' activity. RC Jubilee Hills members participated in Dandia Dhoom, A fundraising event by RI District 3150. It was a colourful evening. Rotary Club of Jubilee Hills organised Peace Pole Dedication Program jointly with Greenwood Kindergarten on the occasion of International Peace Day . Privileged to have DG Rtn Abraham as the Chief Guest. The cute little children of Green Woods Kindergarten had put up lovely charts on the importance of Peace. The Peace Exhibition was inaugurated by First Lady Rtn Sailaja. DG Rtn Abraham unveiled the Peace Pole on which "May Peace Prevail on Earth" has been etched in four different languages. He also shared an excellent peace message. RCJH members had a well attended meeting to hear Mr. Prashant Lingam of Recycle India who gave a wonderful presentation on recycling of scrap. It was very interesting and informative. 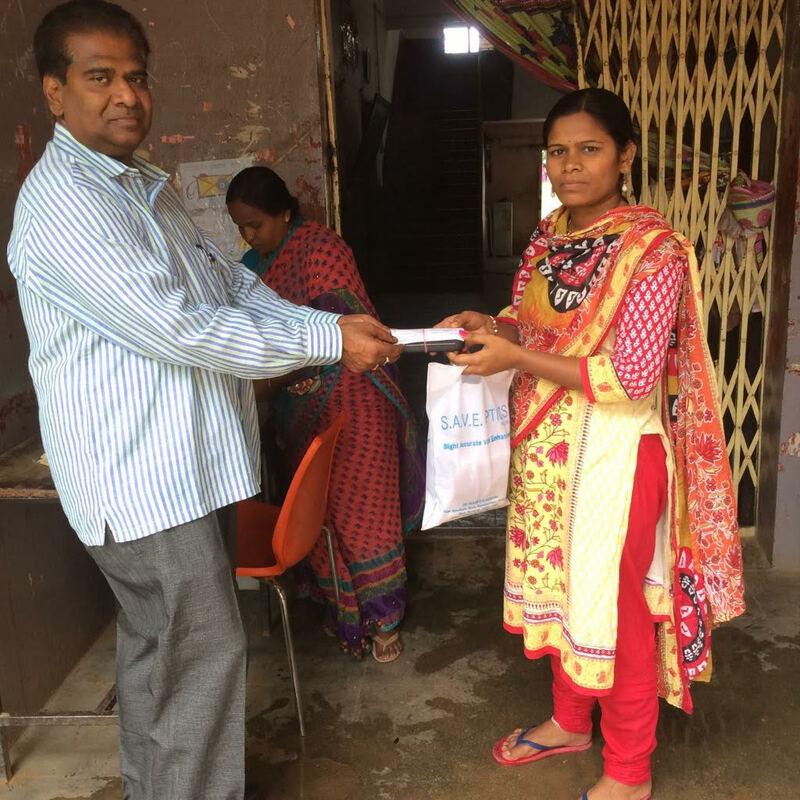 500 notebooks were distributed to the students of Nachiketa Tapovan. Regional trainer for city clubs Rtn P Seshadri spoke on roles and responsibilities of members at our regular rotary meeting. As September is basic education and literacy month, RC Jubilee Hills hosted the Teachers Awards program at CESS Auditorium, Begumpet on behalf of Twin Cities Rotary Clubs and 36 teachers were felicitated. DG Rtn Abraham was the chief guest and Rtn Dr Sashikala was guest of honour. The program was a huge success and received a lot of appreciation. On the occasion of DG's birthday, a lunch get together was hosted at Spicy Venue for Twin Cities Presidents and Secretaries. Each club donated 100 $ to TRF. 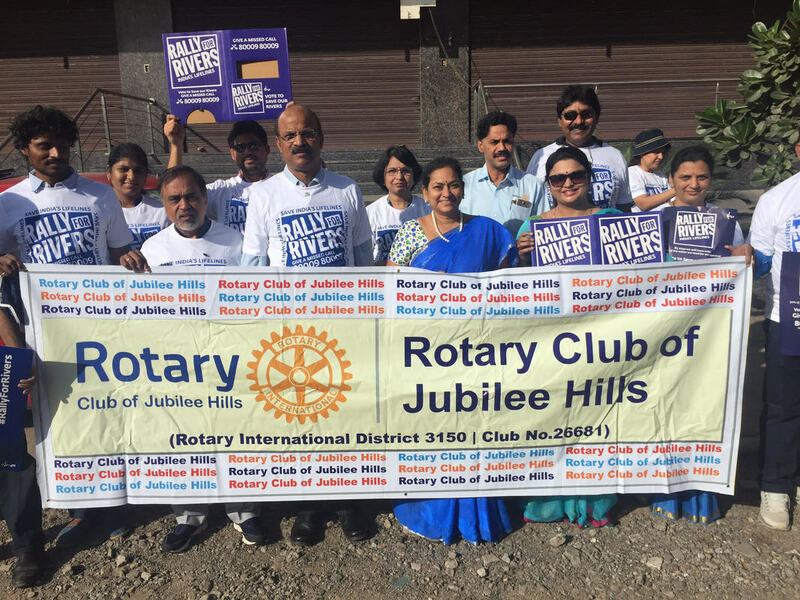 RC Jubilee Hills members actively participated in the Rally for Rivers campaign. 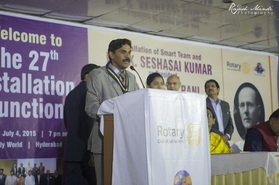 The program helped in building public image of Rotary. All the New Board Members participated in the Installation ceremony of Sri Shakthi College of Hotel Management at Family World.Chief Guest is RTN Jhansi Premanand. Wishing all the members of the GIET Rotaract Club an enjoyable and active Rotary year 2017 - 2018. It's a Joint Meeting with members of RC Greater Hyderabad The Speaker is Dr Rashida Naraharasetti, a specialized energy kinesiology practitioner from Canada. She addressed on the topic “Specialized Kinesiology- an exciting new approach to regaining health and wellnessThe speaker was honoured with a memento by the President. In promotion of eco-friendly Ganesh Festival, the President had arranged for distribution of Clay Ganesha to all the members with the support of Rotary Club of Greater Hyderabad. The installation ceremony of the new office bearers of Interact Club of Gitanjali Senior School, sponsored by Rotary Club of Jubilee Hills was held in the school auditorium. Senior Rtn Jhansi and Rtn Murthy Vadapalli addressed the club members and wished them great success in every endeavour they undertake!!! RCJH members participated in the District Membership Seminar (Mythrivanam) held on 19th of August at Leonia Resorts under the leadership of PDG TVR Murti. Members had great time with the enchanted entertainment. Chief Guest PRID Yashpal Das inspired members by his speech on membership. Rtn Sunita Girikumar was inducted into our club at the seminar. The installation ceremony of the new office bearers of Interact Club of Gitanjali Devshala, sponsored by Rotary Club of Jubilee Hills was held in the school auditorium. Congratulations and best wishes to the new team for a great rotary year!!! Independence Day celebrated at ROSE School. at 9.45 AM with good crowd of staff, students, parents and Rotarians. The Chief Guest Rtn B Sarat Gopal unfurled the tricolor flag and all in unison sang the National Anthem. Rotarians distributed sweets and chocolates to students. Rtn Dr Altaf Akbar, Rtn Dr Sujeeth and Ms Sunitha of MAA ENT Hospital conducted the health check up program. We inducted Rtn Rumana Kirmani into our club on this special day. Twin Cities Rotary Clubs participated in the joint meeting at KLN Prasad Auditorium on the occasion of Independence Day. Rotary Club of Hyderabad hosted this prestigious event. The chief guest for this special program is Dr. Duvvuri Subba Rao - Reserve Bank Governor 2008-2013. He addressed on a interesting topic ‘India-Will the Elephant Start Dancing?’. Guest of Honor DG Rtn Abraham also graced the occasion. The installation ceremony of the new office bearers of Interact Club of Delhi Public School, sponsored by Rotary Club of Jubilee Hills was held in the school auditorium. Wishing the new team all the best and a wonderful year ahead!! The Speaker was Mr Amardeep Singh. He addressed the gathering on a very interesting topic “"Effective Personal Branding to do more in life". The speaker was honoured with a memento by the President. Thanks to Rtn Viji and Rtn Gopu for hosting the meeting. Decisions were taken about fund raising for ROSE and other club projects. 3 Members were inducted to the Club. Chief Guest is Sri PDG TVR Murthy. He has given excellent presentation on Membership focussing about Rotary membership growth and retention strategy and the process of induction and much more. Rtn Ravindra and Rtn Narasimha awarded with Paul Harris fellowship. Rotary Club of Jubilee Hills members actively participated in the 'Planting of Saplings' and cleaning up the lake area along with the officers and the Men of Special Protection Force at Ameenpur Lake. Created general awareness among people to make the Environment Green and pollution free and for better living of the residents. Speaker Meeting : The speaker is Sri K C Reddy, IPS, former member of United Nations probe panel on Gaza. He addressed on a very interesting topic “Challenges of Global Cyber Security”. 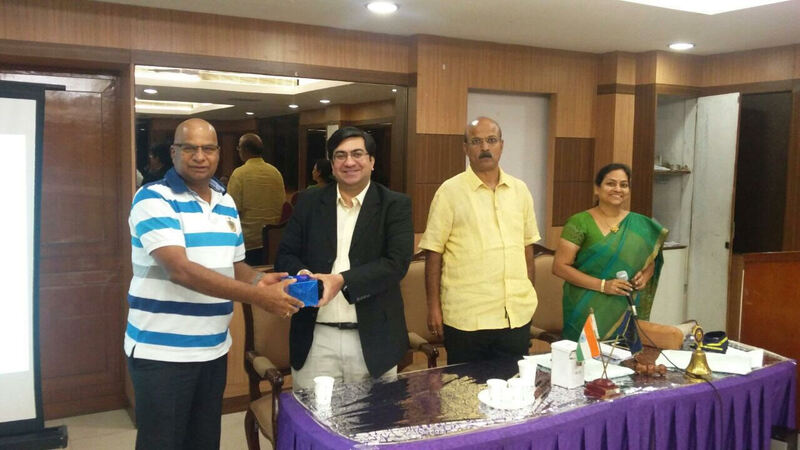 The meeting was a joint meeting with Rotary Club of Ameerpet. The speaker was honoured with a memento by the President. 11th July 2017 - 1st CLUB ASSEMBLY of the Rotary Year 2017-18 held on Tuesday, at JIC, Jubilee Hills. Club directors shared their plans. Rtn Narsimharao submitted statement of accounts for 16-17. Treasurer Rtn Meera proposed the budget for 17-18. IPP Usha felicitated and presented mementos to her team 2016-17. Club members recognised the support of Past President Rtn P P Reddy and felicitated him. Rotary Club of Jubilee Hills held its first board meeting on Sunday, 9th of July at JHIC. Board members presented their plans for the year and treasurer proposed the Budget for 2017 - 18. The 29th Installation Ceremony of Rotary Club of Jubilee Hills under Rotary International district 3150 was held on Tuesday, 4th of July 2017 at Jubilee Hills International Centre. Professor V S Prasad, former vice chancellor - IGNOU was the chief guest of the well organized function. DG Rtn Abraham was the guest of honour and installation officer. Rtn R Vijaya Lakshmi was installed as the Club President and Rtn Dr S V Ramprasad as the Secretary of the club for the year 2017 - 2018. RCJH members participated in the 18th anniversary celebrations of Goonj held at ISB. Members collected usable items and donated to Goonj, a non profit organisation helping people of rural India. Rotary Club of Jubilee Hills members had a wonderful fellowship on Tuesday, 21st of March. 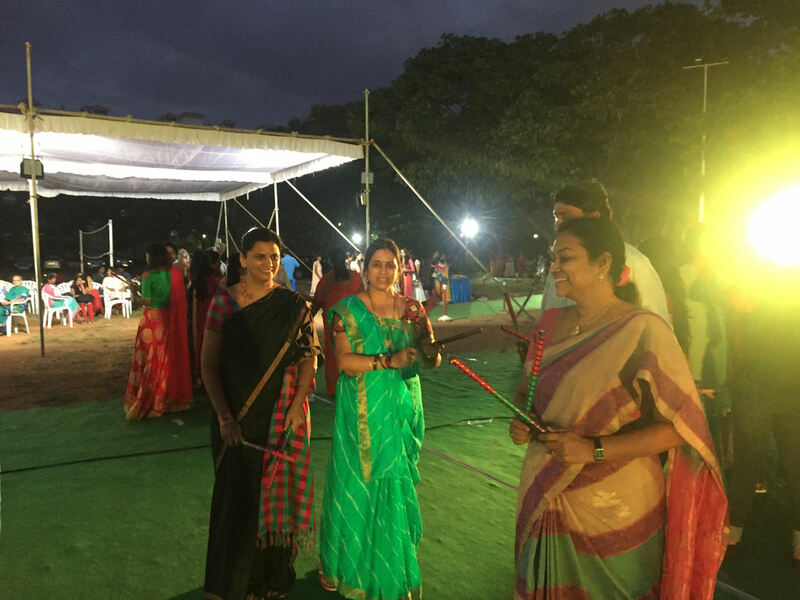 It was an evening of more fun and excitement with interesting programs to celebrate Ugadi. Had a taste of traditional festival food. Rotary Club of Jubilee Hills held it's Board Meeting at JHIC. The main agenda of the meeting was raising funds for ROSE and other club projects. Weekly Meeting On "Know Your Rotarian"
The subject of our weekly meeting on Tuesday, 14th of March was "Know your Rotarian". Senior Rtn TV Balan shared his experiences with members. Director - Membership Services, Rtn Dr SV Ramprasad narrated some interesting details about himself. On the occasion of World Rotaract Week, played a video made by district 3150 Rotaractors. President Elect Rtn Vijaya Lakshmi, Secretary Elect Rtn Dr S V Ramprasad and AG Elect Rtn Sai Kumar attended the Rotary District 3150 PETS&SETS on March 11th and 12th at Shamirpet. It's a wonderful program designed specifically to prepare incoming club presidents and secretaries with the necessary skills, knowledge, motivation, inspiration, Rotary information and new ideas to lead an effective Rotary Club. PDG Sam Patibandla addressed the gathering on 'Promote Rotary'. On Tuesday, 7th of March, RCJH had an interesting speaker meeting presided over by President Usha. Dr B Srinadh - Director at Asian Institute of Fetal Medicine and Reproductive Genetics spoke on "Impact of environmental pollution on human health." Celebrated International Women's Day by honouring our lady Rotarians. Rtn Subhasish Chatterjee from Rotary Club of Siliguri shared his views with the members. ​Rotary Club of Jubilee Hills President Rtn Usha, Secretary Rtn Vijaya and other members participated in the South Asia Literacy Summit at Chennai on 3rd, 4th and 5th of March. It was a wonderful program, attended by RI President John Germ. Had a great opportunity of listening to the literacy heroes and eminent speakers. It was great meeting Rotarians of other districts and learning more about each other's clubs. Rotary Club of Jubilee Hills participated in the joint meeting hosted by Rotary Club of Hyderabad held on Monday, 27th of February at Phoenix Arena. Secretary Rtn Vijaya Lakshmi read the bio data of Shri Pandit Jasraj. Bharata Natyam Performance by French Artist Padmashri Annick Devayani was a visual treat. The Pandit Jasraj - Rotary Club of Hyderabad Award was presented to her by Chief Guest Sri Pandit Jasraj. Sri K Viswanath was the Guest of honour. President Rtn Usha organised a vocational visit to Virchow Pharmaceutical Laboratories at Jeedimetla on Tuesday, 21st of February. Members had excellent time visiting the place. Virchow Labs is the largest producer of Sulphamethoxazole in the world. Chairman Mr Venkat Reddy shared the details of the labs with the members. ​Rtn Seshasai Kumar participated in the AGTS on 18th and 19th of February. He was assigned 5 Rotary Clubs - Jubilee Hills, Greater Hyderabad, Megacity, Medchal and Springfield. PDG Sam Patibandla spoke about the Strategic Plan during the seminar. Senior Rtn Jai Gupta and PDG Val Leivers reviewed the projects - School Benches, RO Plant, sports equipment, computer lab, sewing machines and houses at Bhongir village on 15th of February. On Tuesday, 14th of February, RCJH had a lively meeting. Interactors of Gitanjali Devshala and Meridian School gave their presentations. Rotaractors from IHM Shri Shakti, Shri Shakti College of Hotel Management, GITAM and Global Institute of Engineering and Technology also explained their various projects. President Usha congratulated them and all members appreciated the various programs they conducted. Interactors Partcipated In 'Rainbow District Interact Conference' At KSG Auditorium. 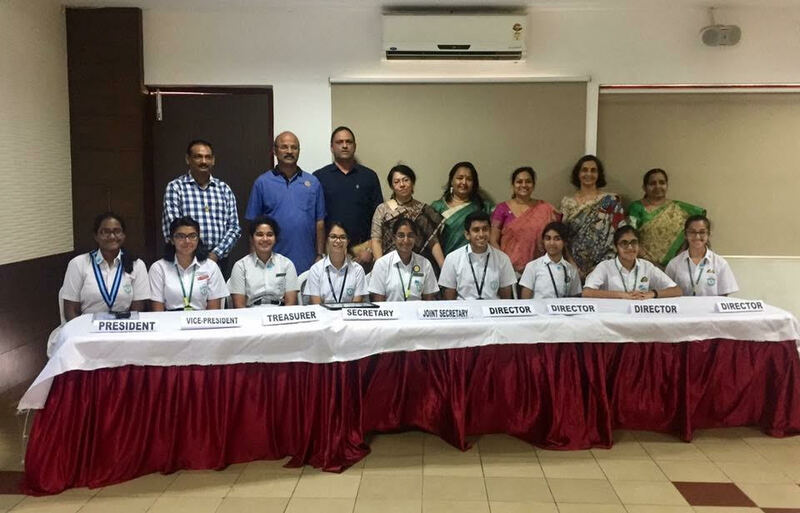 President Rtn Usha and 32 Interactors from 11 Interact Clubs sponsored by Rotary Club of Jubilee Hills participated in the Rainbow District Interact Conference, held on 11th of February at KSG Auditorium. Rtn Dr Ch Vasanth Kumar addressed the Interactors in the afternoon session. Wonderful presentations by Interactors on Tuesday, 7th February at our weekly meeting. Interact Clubs of DPS, Filmnagar Govt School, Prerana Waldorf and Gitanjali Senior School participated in the program. President Rtn Usha appreciated the various activities of Interactors to help the community. Rtn Meera, Chairperson for Interact Clubs efficiently conducted the program. 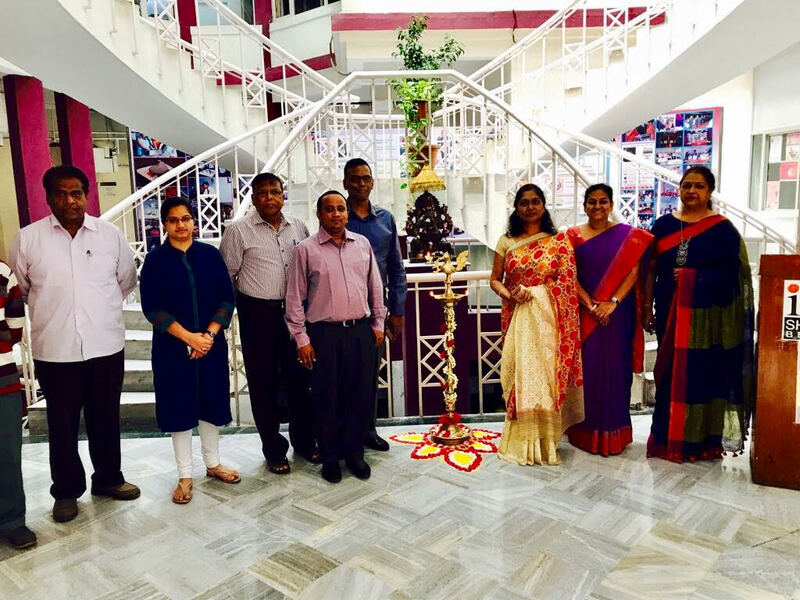 PDG Sam Patibandla, President Usha, Secretary Vijaya and 14 members from Rotary Club of Jubilee Hills participated in the District Conference - Deepavali on 4th and 5th of February held at Guntur. It was a time for District 3150 Rotarians to get together, learn more about each other's clubs and hear some interesting talks. A good time was had by all. Senior Rtn Jhansi Premanand bestowed with Vocational Excellence Award. 'Rotary Fights Cancer' brochure was released by DG Rtn Ratna Prabhakar, organised by Rtn Dr Geetha Nagasree, on the occasion of World Cancer Day. PDG Sam Patibandla addressed the gathering on Conference Resolutions. Rotary Club of Jubilee Hills presented ‘Rotary Vocational Excellence Award 2017' to four persons representing different fields on Tuesday, 31st January at 'Family World'. KBR park watchman Mr Gangaraju, GHMC gardener Mrs Suryavathi, OU Special Educationist Mrs Prasanthi and Mahavir Hospital office assistant Mrs Saradamba were awarded for their outstanding service. Chief Guest of the program Padma Shri awardee Prof. Shanta Sinha felicitated the awardees. AG Rtn KVR Chowdary graced the occasion. President Rtn Usha welcomed the gathering and Joint Secretary Rtn Rajakrishna proposed the vote of thanks. Congratulations to Rtn Rajagopal, Director - Vocational Services for conducting the event in a highly successful manner. RI Rep PDG Joanne Shilling visited our ROSE School on 30th January, saw our project and appreciated it. President Usha, Secretary Vijaya and our members explained her about our ongoing projects. Chief Secretary launched the NID programme on 29th January morning. PDG Sam Patibandla, RI Rep PDG. Joanne Shilling and Rtn. Percy Shilling participated in the program. President Usha and our members created awareness and dispensed Polio Drops at Polio booths at Film Nagar. Rotary Club of Jubilee Hills celebrated Republic Day with great enthusiasm and respect at ROSE School. President Usha, Secretary Vijaya and other members joined Rtn Dr Ch Vasanth Kumar in flag hoisting. Colourful presentation of songs, dance and skit by the students mesmerised the audience. RCJH members led by President Usha joined the 'Twin Cities Rotarians' Republic Day celebrations at Haritha Plaza on 25th of January. ​On 24th January, RCJH had their weekly meeting at AIIE, Nampally. President Usha organised this special meeting. It was very successful in promoting rotary and our club projects. 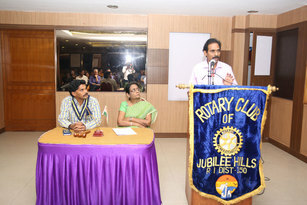 Rotary club of Jubilee Hills held New Members Orientation program on 23rd January. Membership Director - Rtn Dr SV Ramprasad hosted the meeting. President Usha welcomed all the members and conducted the event. The new members expressed their happiness for participating in this wonderful program. Senior Rotarians Jhansi, Sam, Raghav, Dr PP Reddy and Dr Vasanth were the mentors for this session and shared their rotary experiences. On Tuesday, 17th of January RCJH had a well attended meeting presided by President Rtn Usha. Dr BV Pattabhiram - a well known speaker addressed the gathering on 'Happiness is our Choice'. His speech was very interesting and well received by all. We also inducted Mr Viswanath, an E-Commerce businessman into our club. ​Rotary Club of Jubilee Hills organised a picnic to the students of ROSE school. Children had wonderful time visiting Golconda. Students celebrated Sankranthi at school. 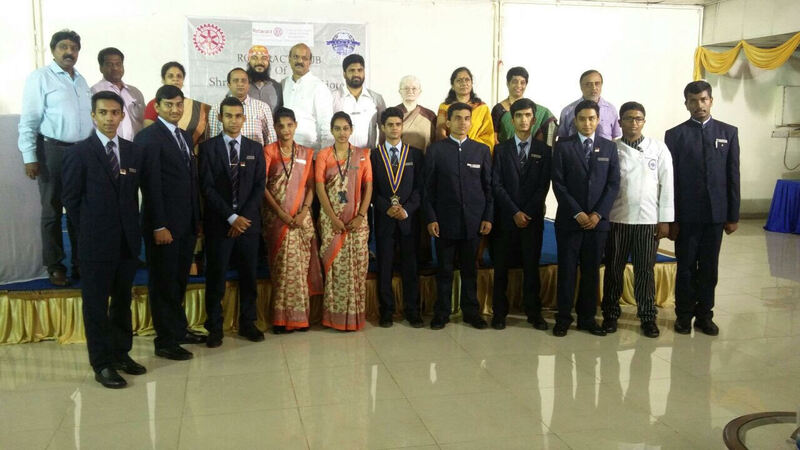 Senior Rtn Jhansi participated in the program 'Excellence in Sports by Rotary Olympic Sports Forum' on 11th January at Ramakrishna Matt. President Usha and Secretary Vijaya attended the program. ​Rotary Club Of Jubilee Hills members had a wonderful meeting on 10th January presided by President Rtn Usha. Celebrated 'rotary' with senior Rotarians Rtn T V Balan and Rtn Sita Balan. We were very honoured to have senior Rtn Balan launch RCJH Flag. Rtn Balan narrated some interesting details to the members. PDG Sam Patibandla, senior Rotarians Jhansi, Raghav and Jai Gupta shared their Rotary memories. RC Jubilee Hills members Rtn Seshasai Kumar, Rtn Rajakrishna and Rtn Chandrappa participated in the Rotary Leadership Institute graduation training Program held in Hyderabad on 9th January. 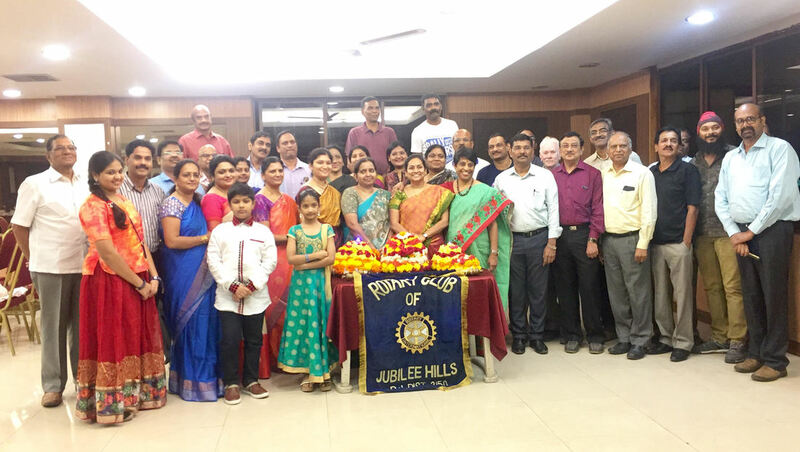 ​Members of Rotary Club of Jubilee Hills spent a super evening with music, masti, dance, drinks and dinner - a wonderful new year fellowship on Tuesday, 3rd of January at JHIC. President Rtn Usha gave her New Year message. We have inducted Mr Chandan Kumar into our club. Rotary Club of Jubilee Hills is proud to charter 14 Interact Clubs in ZPH Schools of Rudraram, Chitkul, Lakdaram, Isnapur, Bhanur, Ghanpur, Muthangi, Patancheru, Pedakanjerla, Kishtareddypet, Sultanpur, Ameenpur, Beeramguda, Rudraram, Chitkul, Lakdaram, Isnapur, Bhanur, Ghanpur and Muthangi of Medak district to provide basic facilities under 'Happy Schools' project on 28th and 29th of December. The Interactors were highly inspired and motivated by Rotarians. President Usha welcomed all the members and conducted the AGM. Club directors presented their plans for the next 6 months. President Elect Rtn Vijaya Lakshmi announced the team for 2017 - 2018. PDG Sam Patibandla addressed the gathering at the District Polio Orientation & Planning Meet held at Narsaraopet on 25th December. President Rtn Usha, Secretary Rtn Vijaya and Past President Rtn P P Reddy attended the meeting. President Usha received her Centennial Dhamaka prize from DG Rtn Ratna Prabhakar. ​President Rtn Usha along with other members participated in the Christmas celebrations at Special Education Centre for the Mentally Capped on 23rd December. St Francis College students also joined in this program. Children had great time and enjoyed the songs and dance performances. President Rtn Usha conducted the 6th Board Meeting on Thursday, 22nd of December at JHIC. The main points discussed are Vocational Excellence Awards function, Formation of new clubs, Chennai Literacy Summit, Atlanta convention, PHFs, New Year fellowship etc. On Tuesday, 20th of December, at our regular meeting, we inducted 4 new members into our club. Assistant Governor - Rtn KVR Choudary was the Induction Officer. Rtn P Kalyan, Rtn Vijaya Santhi, Rtn Anitha and Rtn Teja were very happy for having chosen RCJH and expressed their strong desire to do their bit to the society through the Rotary platform. PDG Sam Patibandla addressed the members and shared some interesting details about Rotary. Rtn Surendra was awarded Paul Harris Fellow Pin which indeed is a proud feeling for every Rotarian. 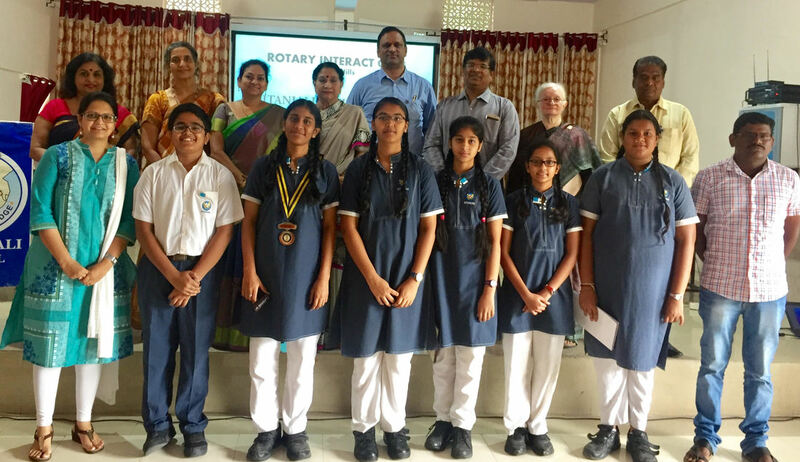 Rotary Club of Jubilee Hills conducted RYLA for students of SMSM ZP High School, Moinabad. A day of nonstop activity and interaction, helping the students to develop their team work & communication skills and fulfill their potential as leaders. 85 Rylerians along with 200 children participated in the Walk for Literacy. The entire program was organised by senior Rtn Jhansi Premananda. President Rtn Usha, Rtn Naresh Raman District Chair RYLA, Rtn PP Kapil Dev RCHyd Central, Rtn Nadeemuddin, Rtn Kamal Kannan, Gayatri Devi, SRI Venkataiah DEO and our members participated and enlightened the students. Rotary Club of Jubilee Hills conducted ROTARY KUSHI TV SANTA DRIVE on Thursday, 15th of December at Film Nagar Government High School. A separate report with photos about this program was sent already. We had a very interesting weekly meeting on 6th December presided by President Rtn Usha with decent attendance. Ms Tinky Bharadwaj, Director of Roshni spoke about a very stimulating topic - Music & Wellbeing. She told us that research suggests that music can help us to: Promote Wellness, Manage Stress, Express Feelings, Enhance Memory, Improve Communication and Alleviate Pain. Rotary Club of Jubilee Hills arranged a bus for the city President Elects & Secretary Elects to attend pre PETS&SETS at Bhadrachalam. President Elect Rtn Vijaya Lakshmi, AG Elect Sesha Sai Kumar and Governor's Special Aide Rtn Ravindra attended from our Club. It was a wonderful program designed specifically to prepare incoming Club presidents and secretaries with the necessary skills, knowledge, motivation and enthusiasm to lead an effective Rotary Club. ​'Getting to know your rotary friends' was the subject of our weekly meeting held on Tuesday, 29th of November . Rtn J Sreeram Murthy, Rtn Rajasekhar Reddy and Rtn A Ramaiah spoke to us about their personal - professional details and their experiences with rotary. President Rtn Usha thanked Rtn Uma for donating $500 to Polio Plus and $500 to Rotary Foundation. Rtn Dr SV Ramprasad was declared elected as Club Secretary for the Rotary Year 2017 - 2018. On Tuesday, 22nd of November, we had a very interesting and lively meeting presided by President Usha. Ms Haimanti, founder of Ishva presented the meeting. 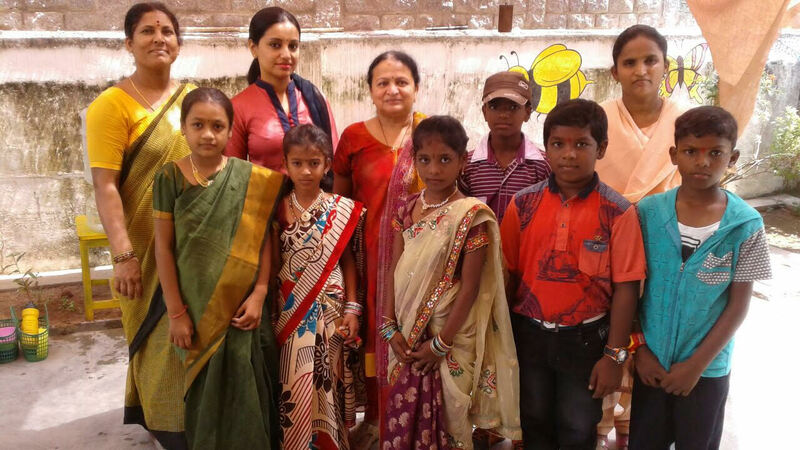 She said Ishva's after-school program exposes the urban slum children to all the constructive extra curricular activities, which they can not afford otherwise. The colourful dance performance by the children mesmerised the members. President Rtn Usha, Secretary Vijaya and Rtn Satya Pinjala participated in the 'Cake Mixing', A Celebration program of Rotaract Club of Shri Shakti College of Hotel Management on 22nd of November. November is Diabetes Awareness month and Rotary Club of Jubilee Hills joined 'The Million Steps To Dodge Diabetes' on 20th morning at Novotel Gardens.This wonderful Walkathon was organised by Rtn Dr Ch Vasanth Kumar - Chairman, Diabetic Care of District 3150, Rotary Club Of Jubilee Hills and RI District 3150 in association with RSSDI to spread awareness about Diabetes in General Population. The program was a huge success. On the occasion of World Diabetes Day, on Sunday, 13th of November, Rotary Club of Jubilee Hills and RI District 3150 organised a Diabetes Awareness and Screening Program at ELBIT Medical Diagnostic Centre, to promote the importance of screening to ensure early diagnosis of type 2 diabetes and treatment to reduce the risk of serious complications. The event was graced by DG Rtn Ratnaprabhakar and First Lady Rtn Siva Kumari. Children with diabetes participated in the drawing competition. President Rtn Usha, Secretary Vijaya and Rtn Satya Pinjala attended the Cake Mixing, A Celebration program of Rotaract Club of IHM Shri Shakti on 11th November. Rotaractors distributed chocolates and cakes to less privileged children. The Charter Presentation Ceremony of Interact Club of Prerana Waldorf school was held on 10th of November at the school auditorium. The newly elected President of the Interact club, Safa Ali gave a very motivating acceptance speech highlighting the ideals of Rotary. The chief guest of the program Rtn Sharma from Rotary Club of Gachibowli addressed the Interactors and encouraged them. President Usha appreciated the children and assured them all the help in doing projects. The main agenda of the weekly meeting held on 8th of November was the arrangements for DG's visit. President Usha asked PDG Sam to explain the members about Centennial Dhamaka and Doing Good in the World. Members watched the video of a very interesting program, which was hosted by Rotary and CDC on World Polio Day. 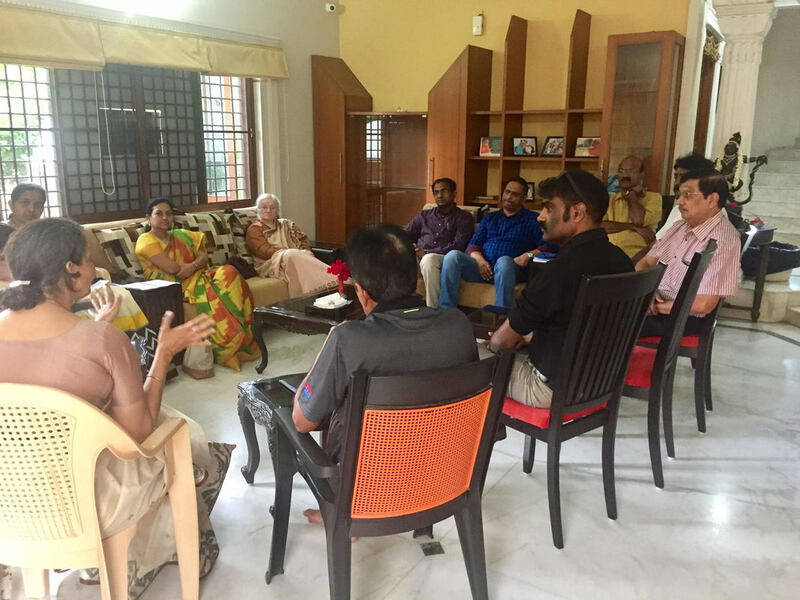 Rotary Club of Jubilee Hills held its 4th Board Meeting on 4th of November at Rtn Ramprasad's residence and President Usha conducted the meeting. Board members discussed about starting new Interact Clubs, upcoming DG's visit, budget, ROSE school, Rotary Foundation, fund rising programs etc. President Usha, Secretary Vijaya and nine more members from RCJH joined the Twin Cities Rotarians to Celebrate Rotary Foundation Month at NKM Grand on 3rd November. It was an excellent session about CSR product and members were motivated to support TRF through Centennial Dhamaka, Doing Good in the World. President Usha, Secretary Vijaya and Rtn Meera - Chairperson for Interact Clubs visited Prerana Waldorf School on 2nd November. Had a good interactive session with students. Guided them about the projects and the children were excited to become Interactors. Rotary Club of Jubilee Hills had a fantastic quiz program at the weekly meeting on 1st of November. Rtn Ratan Jalan, member of RCJH was the quiz master. He has an excellent academic background, and an equally impressive professional portfolio. President Rtn Usha thanked him for a thoroughly enjoyable evening. President Rtn Usha, Secretary Rtn Vijaya, Director - Community Services Rtn Dr MBV Prasad along with other members of RCJH visited two orphanages run by Society of Sisters of St Anne on 30th of October. Rtn Dr MBV Prasad sponsored a special lunch to them on the occasion of Deepavali. President Rtn Usha, Past President Rtn Champaka and other members visited our 'Breakfast in School' project at Manikonda Govt Primary school and distributed gifts to the teachers on 28th of October. The Rotaract Club of Shri Shakti College of Hotel Management, sponsored by RCJH was chartered with the newly elected President - Rtr Bhargav and his able team at Palm Grove - Family World, on 26th of October. President Rtn Usha briefly explained the importance of the Rotaract Club and congratulated the new office bearers and members. Chief Guest of the evening, PDG Sam Patibandla gave an excellent address explaining Rotary and Rotaract. He motivated the students and explained them how Rotary can be a platform to enhance the knowledge and skill for personal development. Rotary Club of Jubilee Hills had a wonderful weekly meeting on 25th of October presided by President Rtn Usha. Inducted two new members in to the club. Past President Rtn Raghav gave an excellent presentation about the history, facts, quality factors, treatments, imitations of 'Diamonds'. Members had great time with Deepavali fellowship. Installation Ceremony of Rotaract Club of IHM Shri Shakti sponsored by Rotary Club of Jubilee Hills was held on Saturday, 22nd October at MP Hall of IHM Shri Shakti. PDG Sam Patibandla was the chief guest. The Rotaractors were highly inspired and motivated by Rotarians. Rotary Club of Jubilee Hills members participated in the motivation session organised by Target 2020 and Sri K Linga Reddy to prevent malnutrition at ZP High School, Isnapur, Patancheru on Saturday, 22nd October. MEO Rathod was the special guest for this program. RCJH inducted 3 more new members on Tuesday, 18th of October. PDG Sam Patibandla was the Induction Officer. President Usha along with other Rotarians welcomed them into RCJH family. Rtn Pavan Kakade addressed members in 'Know Your Rotarian'. President Usha, Secretary Vijaya and nine more members from RCJH attended the Rotary Foundation Centennial Celebrations Seminar held at Hotel Daspalla, Madhapur on Sunday, 16th of October. Rotary Club of Jubilee Hills was recognised for contributing $26.5 each by all the members of our club. Rotary Club of Jubilee Hills had a very interesting, informative and interactive program about Hypertension on 9th of October at Park Hotel, Raj Bhavan Road. The entire program was well planned, organised and conducted by Past President Rtn Dr Vasanth Kumar. Expert doctors participated in the panel discussion, which was followed by an interesting question and answer session. Rotarians got a health check-up done for blood pressure and blood sugar. Rtn Dr Vasanth Kumar thanked President Usha, Secretary Vijaya and other Rotarians for joining the program. RCJH held it's quarterly 'Club Assembly' on Tuesday, 4th of October under President Usha's leadership. Club members unanimously approved for weekly meetings. Treasurer Rtn Narsimharao presented the club accounts for the year 2015 - 2016 and gave so far expenditure details for this year. Rtn Raghav Rao conducted elections for the Trustees of our Trust. President Rtn Usha informed the members about the discussions and decisions made in the board meeting. On the 1st of October 2016, the Rotaract Club of GITAM University, sponsored by Rotary Club of Jubilee Hills was chartered with the newly elected President - Rtr Tejaswanth and his able team at the Seminar Hall of GITAM University. The event was graced by President Usha, PDG Sam Patibandla, DRR Rtr Sreenath, Rtr Madhu, Principal of GITAM - Mr Sanjay and Dean of HBS - Prof Lakshman Kumar. September-"Month Of Basic Education And Literacy"
As September is designated as the month of Basic Education and Literacy in Rotary, RC Jubilee Hills felicitated our own Rotarians, who played a major role in the field of education. 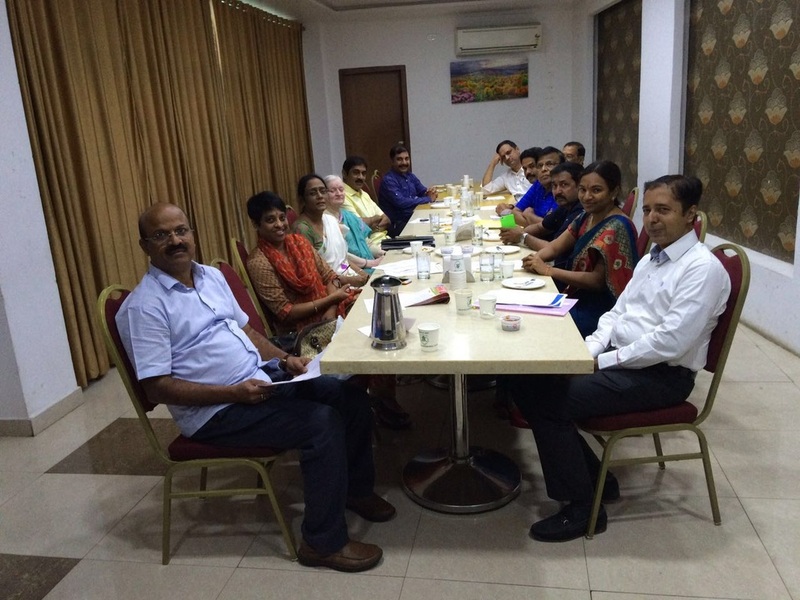 RC Jubilee Hills held it's 3rd Board Meeting on 27th September at JHIC. 18 members attended the meeting and gave their valuable suggestions.With PDG Val Lievers help, RC Jubilee Hills donated 2 computers and 3 sewing machines to Z P School, Thimmapur Villlage, Bhongir for a Literacy Project on 29th September. PDG Rangaiah garu is the chief guest and Bhongir Rotarians also graced the occasion. Past President Rtn Jai Gupta coordinated the entire project. Dr S Bakhtiar Choudary Speech On "Are We Living Life"? Dr S Bakhtiar Choudhary - a reputed painter, photographer, dancer, horticulturist, animal lover, wildlife conservator, educationist and a well known Sports Medicine specialist addressed RC Jubilee Hills on "Are We Living Life"? He illustrated with examples that proper displine in our life, food habits, practising regular exercise , being happy , staying stress free will help us to lead a better life and improve the life span. His talk was indeed very informative and useful. President Usha, Rtn P. P. Reddy, Rtn Meera and Rtn Ramakrishna visited 7 Zilla Parishad schools in Patancheru, Medak district on 19th September and interacted with the students. All the schools have shown great enthusiasm in starting Interact Clubs. The children need only a platform as they are doing lot of activities within the limited facilities available to them. President Usha and other members of RCJH attended the Rotary Saampradaya meeting and had wonderful time watching PAATHAALA BHAIRAVI by Surabhi Theatre at Lalitha Kala Thoranam, Public Gardens. Rotary Club of Jubilee Hills also hosted the Joint Meeting organised by Rotary Club of Hyderabad Pearls at Haritha Plaza on 17th September. President Usha shared our thoughts and projects on 'literacy and education' at the meeting. 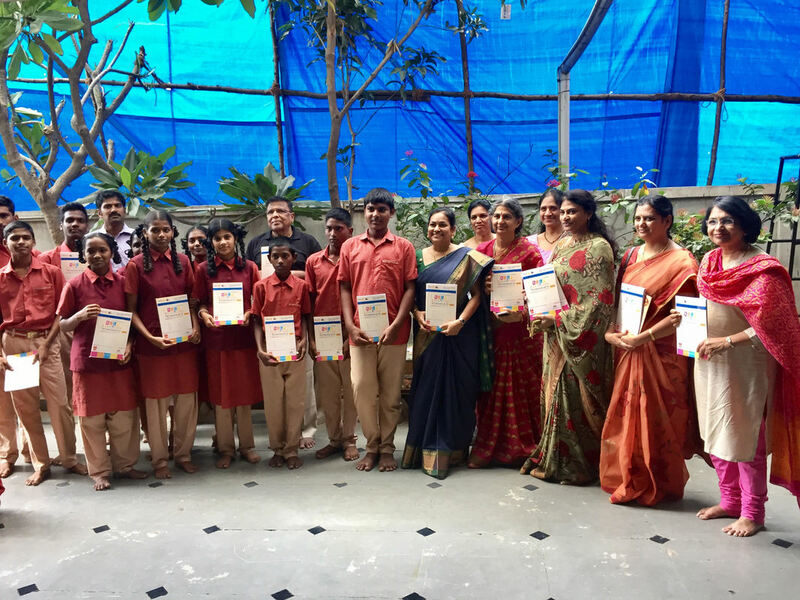 RCJH also participated in the TWIN CITY ROTARY CLUBS JOINT TEACHERS DAY CELEBRATION, hosted by Rotary Club of Greater Hyderabad, held at Sundaraiah Vignana Kendram, Baghlingampally. Ms Radha, a special educator from Special Education Centre for the Mentally Handicapped,Institute of Genetics and Ms.Shahana Parveen of Green wood’s Primary school, Banjara Hills were felicitated by RCJH in this BEST TEACHERS AWARDS PROGRAM. Rtns Raghav, Champaka, Vijji, Vijaya Lakshmi and Chandrappa visited our 'Breakfast in School' project at Manikonda Govt Primary school. In September 2012, RCJH started this project. Each school day more than 200 children, who would otherwise go without breakfast, are receiving a simple meal. The new office bearers of the Interact Club of Gitanjali Devshala, sponsored by Rotary Club of Jubilee Hills were installed. The Interactors were highly inspired and motivated by the Rotarians. The International Literacy Day- gifts were distributed to the teachers of Rose School and Film nagar Govt High School. This gesture was highly appreciated by the teachers , as each gift was individually handed over to them in front of their students - followed by large applauses. Dr K S Ratnakar, Chairman, Global Medical Education & Research Centre, Global Hospitals, and Former Dean, NIMS addressed Rotary Club of Jubilee Hills on 6th September. Dr Ratnakar is a renowned medical practitioner, a popular writer and a motivational speaker. Members had good time listening to his inspirational speech. Giving further thrust to RCJH's T-E-A-C-H initiative, Rtn Champaka Rao organised a Life Skills education programme for the students of Class 10 of the Filmnagar Govt High School. Rtn Madhavi Sasanakota, a member of Rotary Club of Smart, who runs an N.G.O called Swashakti Smart conducted the 1st session of the programme. 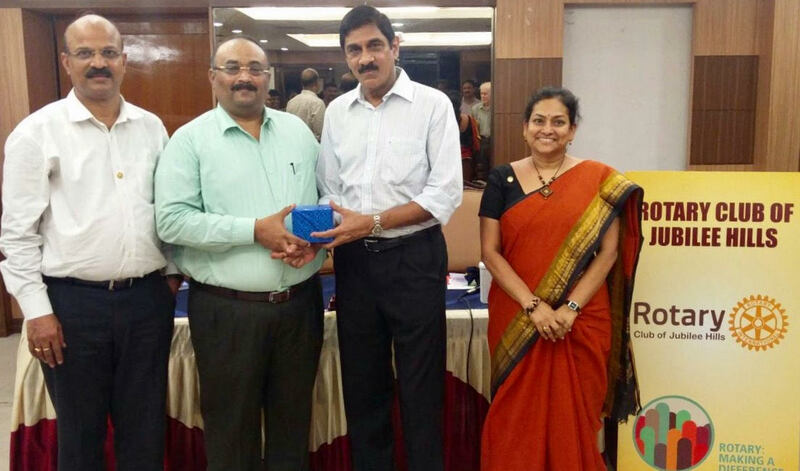 RCJH participated in the 'One Lakh Note Books Project' initiated by DG Rtn Ratna Prabhakar Anne. We distributed 3000 note books to Film Nagar Govt School children. RCJH organised Peace Pole Dedication Program jointly with Greenwood Kindergarten on Hiroshima Day. Privileged to have PDG Rtn Suresh Chandrasekhar as the Chief Guest. The Peace Pole was unveiled by PDG Suresh on which "May Peace Prevail on Earth" has been etched in four different languages. ​Our President and Past President PP Reddy visited the Chartered President of our club to wish on his 83rd birth day.